The purpose of my design, for a new disabled sign, was to address several perceived shortcomings with the existing form. As you will see from the comparison below, I have attempted to depict the wheelchair user in a more dynamic manner. Rather than sitting still and leaning slightly back in a rather passive manner, the person in my version is more active and clearly moving forward. I have also made the wheel smaller, as it was felt by some that the wheelchair dominates the old version. 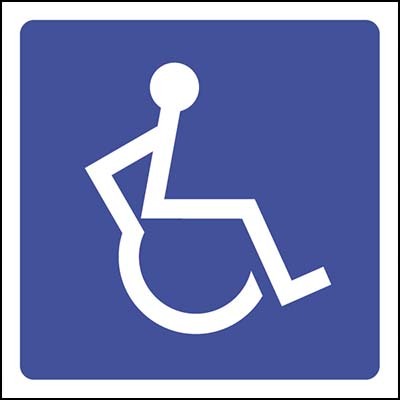 In this manner it is hoped that the sign appears to be more about the person than the wheelchair. I also considered it necessary that the new sign should be instantly recognisable to older people with dementia and those with learning difficulties, who are familiar with existing signage.